"The vast body of published texts, which constitute the genre of serial killer fiction, reveal common narrative technique and tropes that signal a prevalence of clichéd formulaic novels representing the majority of works within this genre. However, amongst this stylistic and thematic majority, works exist that extend the boundaries of serial killer fiction through the import of different genre concerns and attributes. This thesis considers the impact and importance of these works and how they have influenced the stylistic and thematic direction of the genre as a whole. Focussing on twentieth century American post-war serial killer fiction, this study examines select works to exemplify aspects of the narratives that directly, or indirectly, transform, challenge and critique the genre conventions in which they are written. Of primary concern is the charting of the trajectory of the genre as a postmodern phenomenon, the evolution and expansion of the genre in terms of its popularity with the reading public in line with the growth of media interest in factual representations of serial killers, and the growing interest in the genre and its possibilities by those authors who usually write outside of it." Supernatural demons, murderers and ghosts roam these pages although the most horrifying aspect Cook describes, is the dark soul of humanity. Whether writing about the psychological horrors of modern life, or things that go ‘bump in the night,’ Cook’s writing is always “intense” and often “visceral” in his portrayal of the macabre. Included in this collection of fifteen stories is a novelette (Dead and Buried) and the origin story (Legacy: The Eternal Now and Thereafter) behind the novel, Blood Related. This book is also available FREE to all new subscribers of this website - if you are not already subscribed, why not grab a free copy here instead? 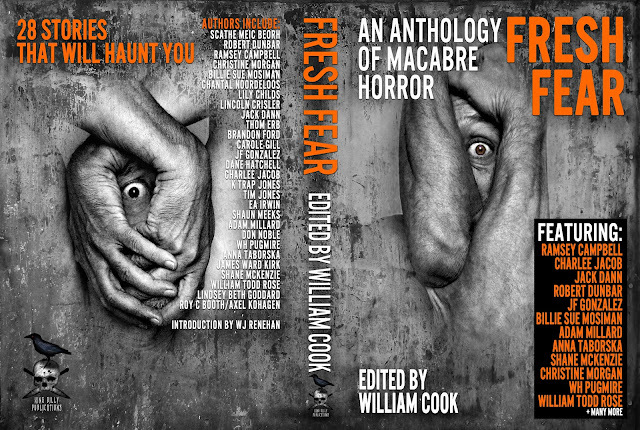 The second discounted title is the popular collection I edited, Fresh Fear: An Anthology of Macabre Horror. I have reduced the price and the kindle version is $2.99 for a limited time. Well that's about all for now but make sure to visit again soon and share this post with your pals. Thanks for reading.